Happy Monday! 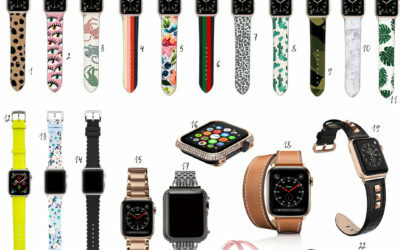 We have a long awaited post that we can’t wait to share with you all. We know the celery juice is all over social media, and a lot of you may see it is as a fad. We were honestly pretty skeptical of all of it at first, but had been struggling so much with our health for the last 7 years on and off, that we were willing to try it. In case you missed about our health struggles, you can read about that in this post. Well, now we have been drinking celery juice and eating plant-based and lower fat for over 6 months now. We honestly haven’t felt this well in a long time. We are still healing and still have our moments where we don’t feel as well, but overall, we see a huge difference. We will be answering a bunch of your questions that we have been getting further down in this post, but before we get into that, we wanted to share more about how eating this way and drinking this juice has helped us. To sum it up, we have hypothyroidism, and have had it for over seven years. We were taking medication every morning up until a couple months ago, and had seen lots of physicians and natural practitioners (functional medicine). We had every test performed under the sun and were diagnosed with digestive issues (SIBO, yeast overgrowth, etc). We tried eliminating all types of foods like lectins, fruits, eating higher fat, etc. We didn’t really feel that much relief from anything. During this time, we also were put on a medical grade heavy metal detox by a practitioner that made us very sick and weak. While we may have had heavy metals in our body, this did not help us, rather it made us worse. It was extremely frustrating because we wanted to help ourselves, rather than make it worse. In July/August of last year, we were extremely swollen and inflamed and could barely go on walks because we had no energy. Our hormones were totally imbalanced and we had trouble sleeping. It was around this time that we were introduced to Medical Medium and the celery juice. It was the total opposite of what we were used to eating and doing, but we were so desperate, we were willing to try it. We listened to several of his podcast episodes, specifically on liver health and Fatty Liver, and on protein. We were both convinced to try eating plant based and lowering our animal fat intake, as well as trying the celery juice for a few weeks. We also read his Liver Rescue book and Life Changing Foods book. It was definitely an adjustment in the beginning not eating a lot of animal products, but now, 6 months later, we are almost fully vegan, and don’t really crave meat anymore. We have so much more energy, and our digestion is a million times better. Our skin is clearer, we think clearer, we sleep better, and this list goes on and on. 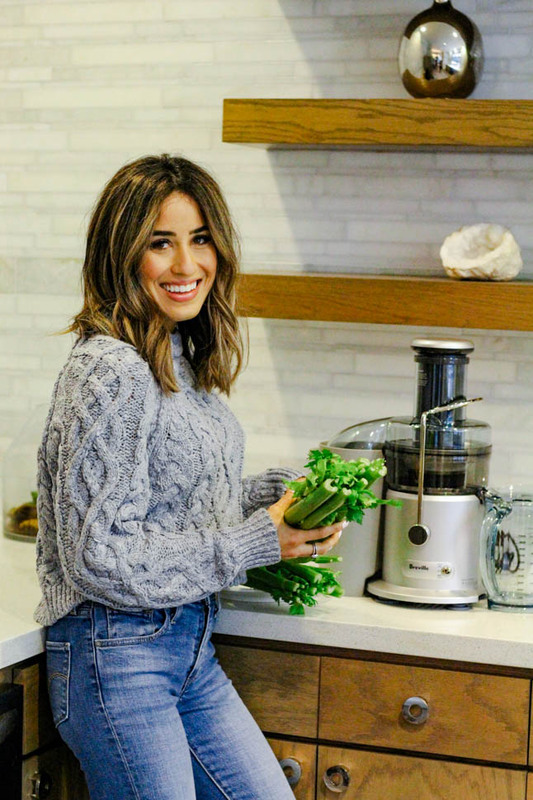 We do have detoxing symptoms some days, and when we first started juicing, we had headaches, bloating, and breakouts from the initial detox symptoms, which we read is normal! WHAT IS THE RECIPE FOR THE CELERY JUICE? There isn’t a fancy recipe! 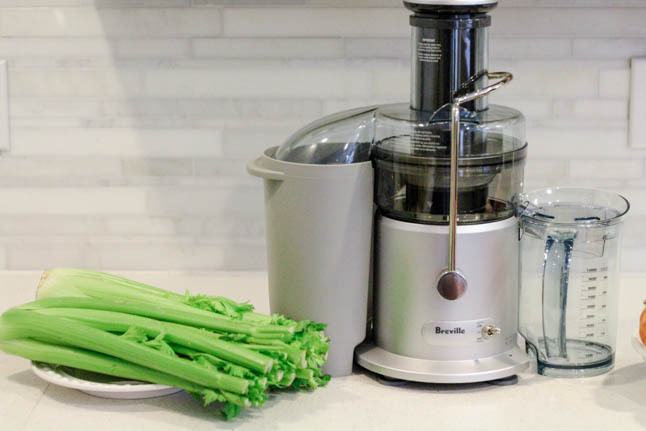 If using a juicer (which we recommend), you simply use one bunch of celery (a head), and rinse well. Put in the blender and drink up! 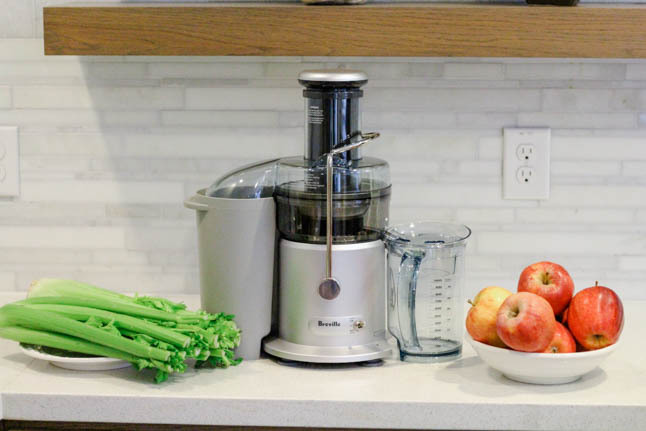 *If you don’t have a juicer, you can use a high-speed blender like the Vitamix to blend. Then, you will have to strain it and drink up! We have two juicers! We just got this one (the one in the pictures) from Bed Bath and Beyond, and love it! 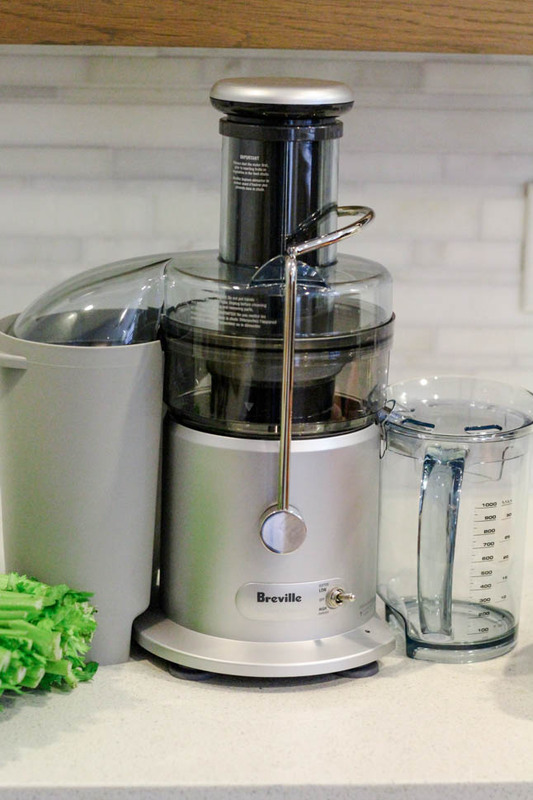 We shared another juicer in one of our previous FAQ posts! HOW DO YOU DRINK IT IF YOU HATE THE TASTE OF CELERY? We have honestly gotten used to it, but if you absolutely can’t stand it, you can juice one cucumber and/or apple with the celery. Medical Medium explains more here on that. DO YOU STILL GET THE SAME NUTRIENTS IF YOU JUICE A FEW DAYS AHEAD? We always make ours the day of and will get up earlier to do that, but if you can’t do it, you can make it one day ahead and be sure to seal it in a mason jar in the fridge right after your make it. HOW MANY OZ DO YOU DRINK? We drink 16oz of it every morning, but some days we try to have more. Ideally, we would like to have 24-32 oz. IS THERE A GOOD TIME TO DRINK THE JUICE? From our research, the best time to drink the celery juice is in the morning on an empty stomach. We usually wake up, have our lemon water then wait 30 minutes. Then, we will have our celery juice, and wait another 20 minutes before eating our breakfast, which is usually fruit! If you can’t drink it first thing, drink it on an empty stomach whenever you can throughout the day! CAN YOU JUST EAT THE CELERY INSTEAD? From what we have read, you won’t get the same benefits! According to Medical Medium, the only way to get the healing benefits is by removing the pulp. You will also most likely not be able to eat enough celery in a day to get the benefits of it. DID YOU GAIN WEIGHT WITH YOUR LIVER AND THYROID ISSUES? Yes, we did. We had gained weight with our thyroid condition (most of it is just swelling and water weight), and then had lost it. We felt it creeping back on slowly in the last few years, which we believe is due to our liver. HOW LONG DOES IT TAKE TO SEE OR FEEL RESULTS? We would say we saw results in our digestion within the first few weeks, but every body is different. Even if you don’t physically see or feel any benefits, you are still healing and receiving the benefits of it, so don’t give up! DO YOU STILL EAT FISH OR CHICKEN? We don’t really eat a lot of chicken, but will occasionally eat fish when we are craving it. It took a while, but now we don’t crave it as much as we used to! 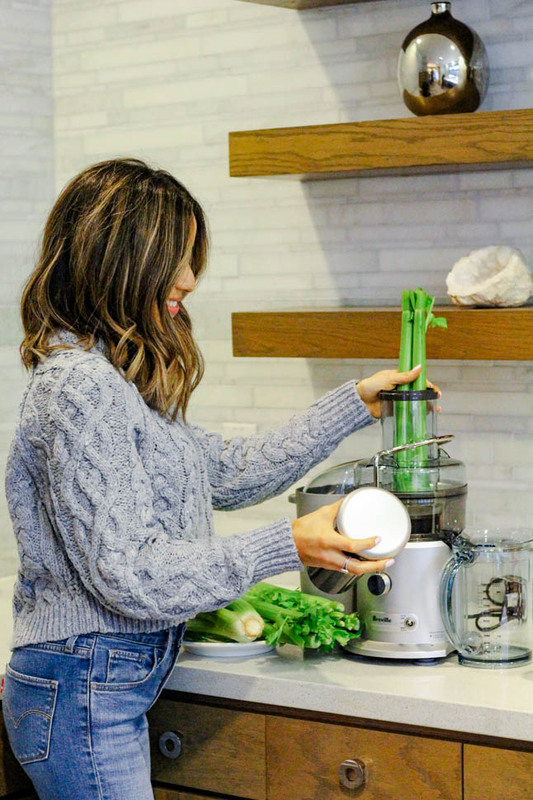 Even if you don’t have any major health issues, we think incorporating celery juice and more fruits and vegetables can’t hurt at all, and it is never too late to start! These are the foods that heal us and are incredible for us! 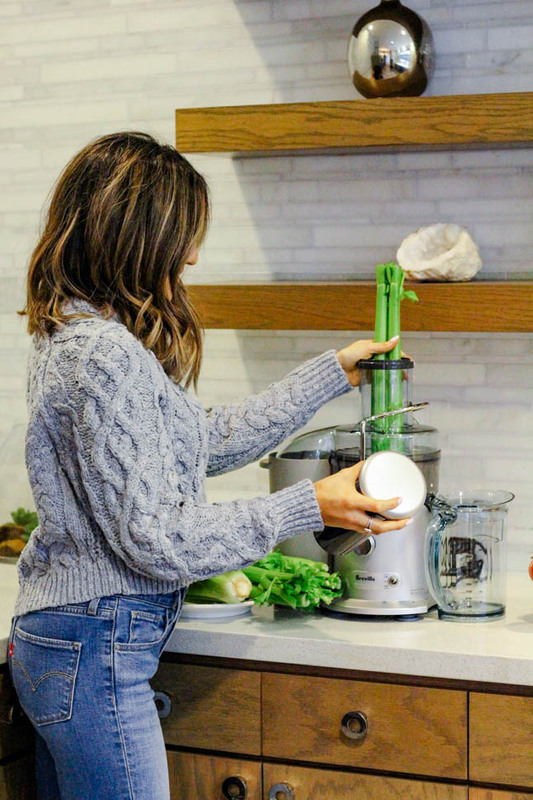 We got our juicer at Bed Bath and Beyond, and it was so easy to order and pick up because all you have to do is order online and pick up in store! 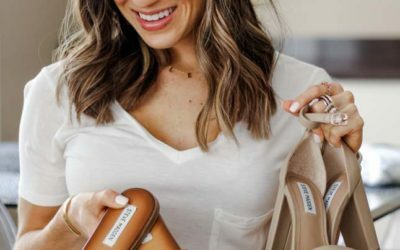 They also offer free shipping on orders over $39. In partnership with Bed Bath and Beyond.